EarthLabs for Educators > Climate Detectives > Lab 2: Coring Is Not Boring! Students build a model sediment core drill, then use it to take core samples from layers of PlayDoh. 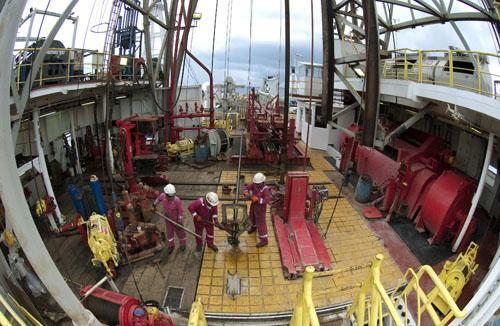 - What is the IODP is and what role does it play in helping us understand our planet's history? - What JOIDES Resolution instruments and technologies allow scientists to collect data and extract relevant data from the sediment cores and bore holes? In Part A: Building a Model Core Drill - In Part A, students use the engineering design process to build and test a model coring drill capable of penetrating several sediment layers represented by different colors of PlayDoh. Their goal is to recover a core sample from a model of the ocean floor composed of different layers of clay. Materials for the "Sediment beds"
Build the test area/bed of sediment area ahead of time. 1. Any kind of aluminum baking pan (or cover) will serve as the base for the model. a. Draw a grid on a piece of paper with numbers and letters so students can identify where their test cores were taken. Tape it into the test box. b. Sprinkle a little white flour on the bottom of the pan. 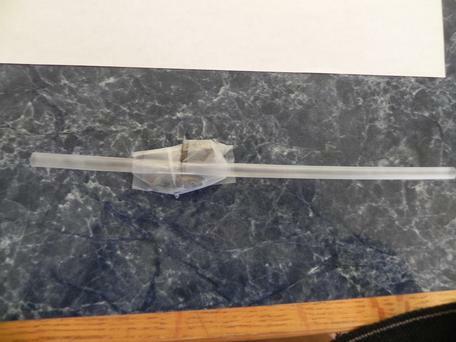 This will prevent the PlayDoh from sticking to the pan when students take a core sample. 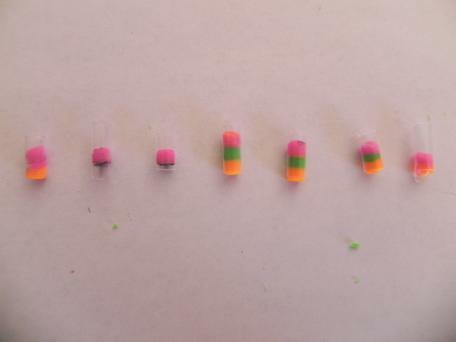 c. For the bottom layer, use two cans of one color of PlayDoh. Spread it into a layer and place it on top of the paper grid. NOTE: If you don't add ash to the second layer in the next step, these layers will peel apart after you're done testing so you can reuse the PlayDoh. d. Sprinkle a little flour on the first layer. Then take a different color PlayDoh and make a lens of material (varying thickness) and place it on the first layer. Optional: Add a layer of ash in a different part of the layer. e. Sprinkle a little flour on the lens and the cover both layers completely with a different color PlayDoh, carefully covering the layers below. 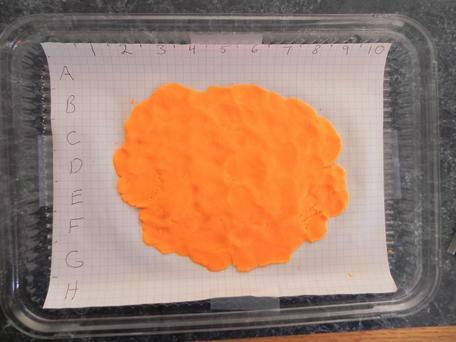 f. Add a thin layer of sand on top of the PlayDoh to simulate the appearance of the ocean bottom. 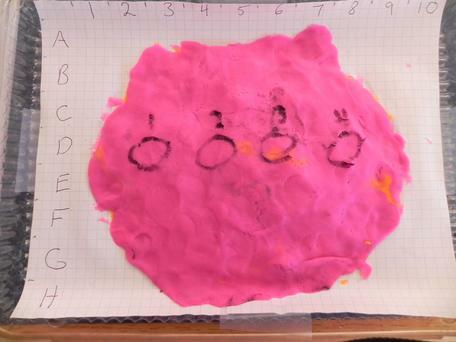 g. Mark coring sites directly on the PlayDoh to give students a target to drop their drills. They will drop them from a height of one foot above the "ocean floor." Or, have students mark where they have drilled into the deposits and then have them compare their cores. But, trying to hit a small target with a drill might bring home the extreme difficulty of engineering the sending a pipe through a mile of water to drill a 1000 ft. hole without changing its position at all! 4. Introduce the Challenge – The challenge is to: Build a coring device that you can drop over a distance of at least a foot to take a core sample of at least two layers of sediment, i.e. PlayDoh. 5. Explain to students that they will be building a model coring device that mimics some of the aspects of the drill on the JOIDES Resolution. Show the students the materials they will work with and describe the challenge for the day. 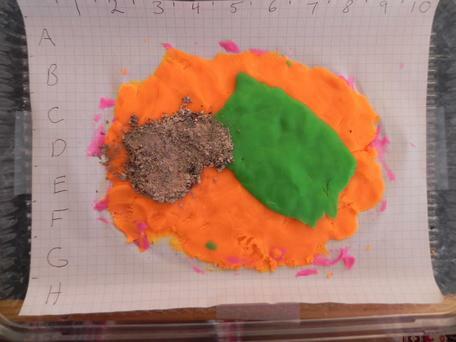 Explain that they will investigate a series of sites in an area of ocean floor sediments that will be modeled by different layers of PlayDoh. You may want to post the graphic at the end of this document to emphasize the phases of the engineering design process. Go over it with students. 6. Show students the completed ocean floor model testing area. 8. 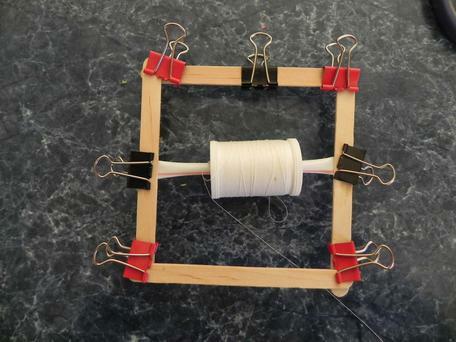 Give student 20 minutes or so to come up with a design and build it. If you think it necessary, show the example device pictured below. 9. 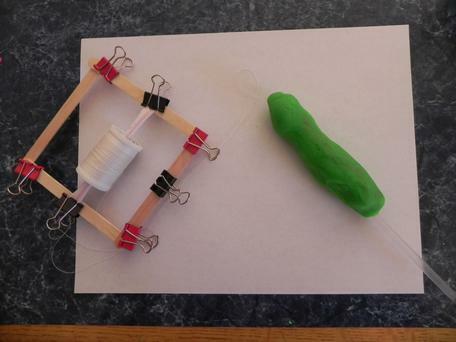 When students are finished building, give them a can of PlayDoh and let them test their coring devices. They should make a few layers and then drop their coring device from a foot above the clay. Many students will need to revise their designs and add weight or other wise change the configuration or structure of their models. 10. Then let groups have a go at the prepared test area (ocean floor model) you prepared earlier. It might be fun to give groups different targets, either by circling drill sites or by giving them a specific letter-number target on the grid. · Give them a copy of the grid used in the test area or make one large one for groups to record their data on. · Have each group pinpoint where on the grid they made their core. · Have them write the colors of the layers found in their cores. · As a group, have them trace the outline of the lens of green PlayDoh (or whatever color you use). This method parallels how geologists might quantify the size and extent of ore deposits or other types of formations. 12. If you ask students to take a series of cores across the test area, students could measure the distance beginning from the right edge to each core, and measure the thickness of each sediment layer, and draw a cross section of the model to reveal the size and extent of the layers (and lens). Wrap Up: Ask students how is their model of a drill is similar to the actual way cores are obtained on the Joides Resolution. How is it different? Suggestions for how to use Student Notebooks for Lab 2. 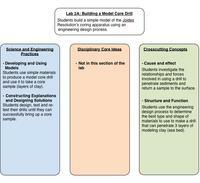 There are several options for assessment of student understanding of material introduced in this lab. Choose from the following list, or create your own. Explore background information and content extensions related to Lab 2.